Gifts for Godparents are really hard to find. How many times do we hear "Don't get me anything." 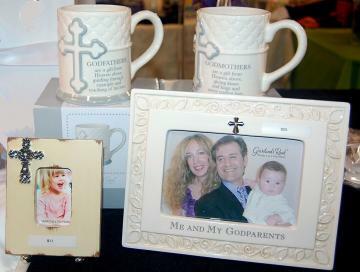 twogreekwomen will continue to search for wonderful Godmother and Godfather gifts. Some of these items may be used as party favors. For a small additional fee, we will customize packages to include the traditional Jordan almonds. 12 oz. ceramic mug, cream & silver, give kisses and hugs.